There was no shortage of NBA action on the second Sunday in January, with seven games on the docket. We got things started early with two Eastern Conference matinees. Ben Simmons put up a monster game to help the Sixers hold off the Knicks, while the Raptors won a double-overtime thriller over the Wizards in D.C that featured a duel between Kawhi Leonard and Bradley Beal. Then the Bucks cruised past the Hawks, while the Magic took over in the fourth quarter to score an impressive win over the Rockets. Plus, Steph Curry dropped 48 points to lead the Warriors past the Mavericks. Later on, Nikola Jokic went for 40 points to help the Nuggets escape with an exciting win over the Trail Blazers. To cap off the night, the Cavaliers halted their 12-game losing streak with an impressive win over the Lakers, who are still without LeBron James. 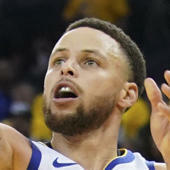 When Steph Curry gets into a zone, there's not much you can do to get him out of it, as the Mavericks found out on Sunday. Chef Curry cooked the Mavericks for 48 points thanks in large part to 11 made 3-pointers. He also added six rebounds and five assists to lead the Warriors to an exciting win over Luka Doncic and the Mavs. The rookie had a strong game himself, finishing with 26 points, six rebounds and five assists. The Raptors were cruising to a win over the Wizards until Bradley Beal and Co. came roaring back to force overtime, and then double-overtime. But in the end, Toronto pulled out the victory by two points in a thrilling contest. Along the way, Beal and Kawhi Leonard staged their own personal duel. Beal finished with 43 points, 10 rebounds and 15 assists, recording his second 40-point triple-double of the season. The only other player with such a game this season is James Harden, who has done it four times. Leonard, meanwhile, went for 41 points of his own, and added 11 rebounds, five assists and three steals. Nikola Jokic kept up his strong season with an MVP-level performance in the Nuggets' win -- their 12th straight at home -- over the Trail Blazers. Jokic finished with a season-high 40 points, 10 rebounds and eight assists. Most importantly, he scored four of those points in the final minute to give the Nuggets the lead for good. The Sixers hung on to beat the Knicks, but it was a much tougher task than they probably expected. Ben Simmons, as per usual, was the main factor in their victory. He finished with 21 points, 22 rebounds and nine assists on 10-of-13 shooting from the field. The 22 rebounds were a career-high, and it was also his first 20-20 game. James Harden had a bizarre night in Orlando on Sunday. On the one hand, he shot just 1-of-17 from 3-point land as the Rockets collapsed down the stretch against the Magic. At the same time, he kept up his 30-point streak -- extending it to 16 games to tie Kobe Bryant for the longest such streak since the NBA/ABA merger -- and finished with 38 points, nine rebounds, 12 assists and four steals. Luka Doncic gave us another ridiculous highlight on Sunday against the Warriors. Driving down the middle of the floor, he used a nifty behind-the-back move to split two defenders, then dropped an alley-oop to Dwight Powell. Steph Curry showed off his skills early against the Warriors. Not his shooting, but rather his dribbling and finishing ability. Check out this slick crossover and impressive finish in the lane. Giannis Antetokounmpo missed out on the Bucks' last game against the Wizards, but he was back in the lineup on Sunday against the Hawks. And he was ready to go. The Greek Freak went for 33 points, six rebounds, four assists and three steals to lead the Bucks to an easy win. Then, after the game, he got to swap jerseys with Vince Carter. Kevin Knox had the highest scoring game of his young career on Sunday. Though the Knicks couldn't get the win, it certainly wasn't Knox's fault, as he poured in 31 points. Terrence Ross is one of the best in-game dunkers in the league, and he proved it once again against the Rockets. Out on the fast break, Ross soared for an emphatic one-hand slam. Trae Young has already shown that he is more than capable of knocking down shots from all over the floor and he reminded Giannis Antetokounmpo of that fact on Sunday by hitting a step-back jumper over the MVP candidate. Joel Embiid showed once again why he's one of the best big men in the league. First, he got up for an emphatic rejection on the defensive end, then he ran the floor and threw down the slam off the fancy feed from TJ McConnell. The Milwaukee Bucks let the Atlanta Hawks hang around for a little while on Sunday before opening things up and creating a sizeable gap between the two in the second half. With the Bucks looking to wrap things up in the fourth, Giannis dropped off this dime to Eric Bledsoe. Bradley Beal has been impressive since John Wall went down with a season-ending injury, and he kept that up early against the Raptors with a strong drive and dunk. Ben Simmons got the Sixers' game with the Knicks off to an exciting start with a sweet one-hand alley-oop. What's the next step for the Nets? What's next for the Brooklyn team that exceeded every expectation this season?